This amazing Heart Rate Monitor Watch helps you easily check your heart rate at any given moment, even while exercising. Monitoring and controlling your pulse rate can help prevent heart attacks! And medical experts say keeping your pulse low when not exercising is critical to heart health. In fact, your resting heart beat is linked to your blood pressure! 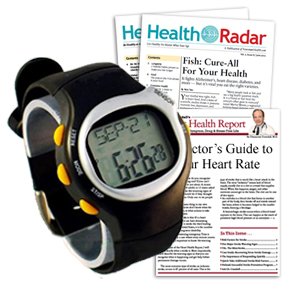 And despite the high-tech benefits, this Heart Rate Monitor Watch is as simple to use as 1-2-3. Now you can find out what your resting heart beat is, detect how exercise and even stress raises your heart rate — and find out ways to lower your heart rate to save your most critical organ millions of beats so it doesn't overwork! Dr. Crandall's report will give you new understanding about both your heart rate and high blood pressure. He even explains how to safely raise your heart rate to make it work more efficiently.